If you are in the ultra-competitive manufacturing world, you are always looking for an advantage. This is especially true when it comes to die molding specialty products like magnetic rotary pumps. At Helander Metal Spinning we believe that hydroforming is one of the best ways to save money and raise quality levels. 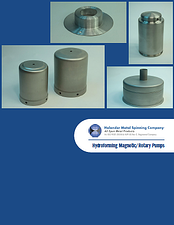 That is why we want to share with you our newest eBook, Hydroforming Magnetic / Rotary Pumps about the benefits of hydroforming your magnetic rotary pumps and other products. When combined, all of these benefits add up to a metal forming method for your magnetic rotary pumps, along with many other products. If you want to learn more about how Helander Metal Spinning uses hydroforming to create superior and cost-effective magnetic rotary pumps, download your free copy of our latest eBook by clicking the link below.